Despite my absolute undying love for Siem Reap we had to move on so we boarded our minivan to make the 7 hour trip to Phnom Penh. Unfortunately this journey in an overcrowded, poorly air conditioned minivan on bumpy dusty…roads (roads is quite a generous term for the tracks we drove down) with a mad driver was made even worse by the fact that Dan beat Mr Lucky at pool 5 times the previous night which was quite a cause for celebration. The beer was definitely flowing and the sleep definitely was not so we weren’t feeling too bright and breezy when we got up at 6am to get the bus. The journey genuinely was terrifying. The lady next to me kept bursting into tears! If you are going to travel around Cambodia try to use the Mekong Express. Our journeys with them were so much better. I find Phnom Penh a strange city and it took me a while to grow to like it. Everything is very spread out. There doesn’t seem to be one main area to go and in typical Cambodian style there are no proper pavements and walking anywhere does involve narrowly avoiding being run over by bikes and tuk tuks! We tried to explore a little and realised that most of the restaurants and bars are down on the river front. This area is also heavily populated with children and adults begging and trying to sell you things. Some even come into restaurants if no one from the restaurant shoos from away quickly enough! 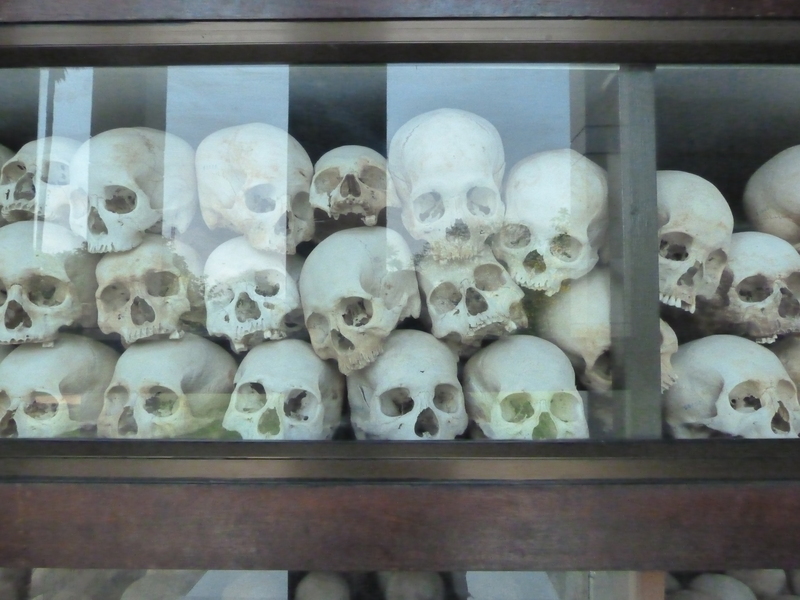 Before our visit to Cambodia I knew a little about the Khmer Rouge and what had happened in the 1970s. I only found out about it recently and was quite shocked at how I been blissfully unaware of the atrocities that had taken place. 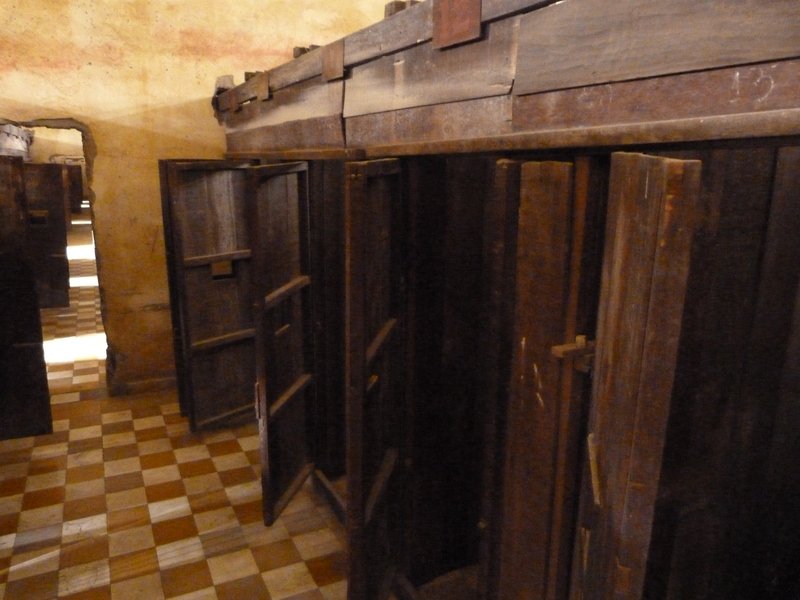 In a strange way I was looking forward to visiting Tuol Sleng Museum of Genocide and Choeung Ek (the killing fields) as I wanted to learn more about the history of Cambodia and what the motivation behind the genocide was. To do this we got a tuk tuk driver for the day for $20. 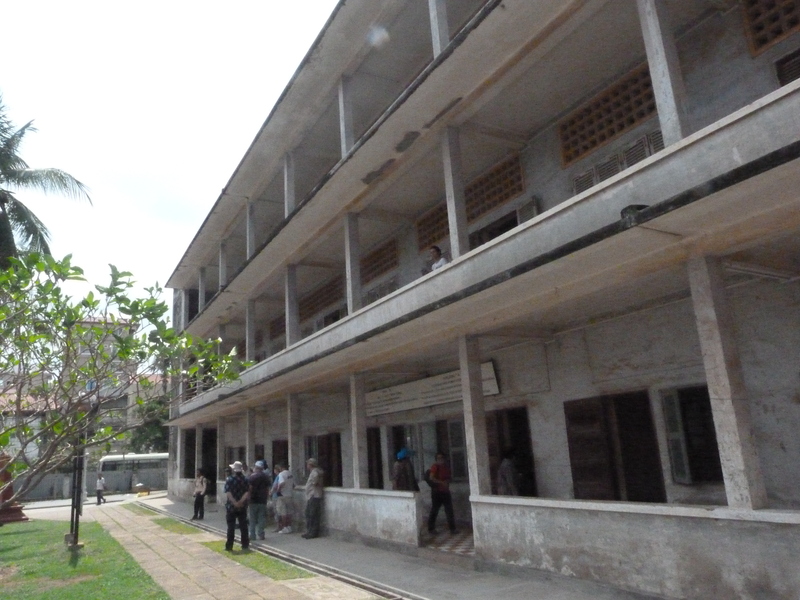 We had been advised to go to Tuol Sleng first as it puts what you see at the Killing Fields in context. 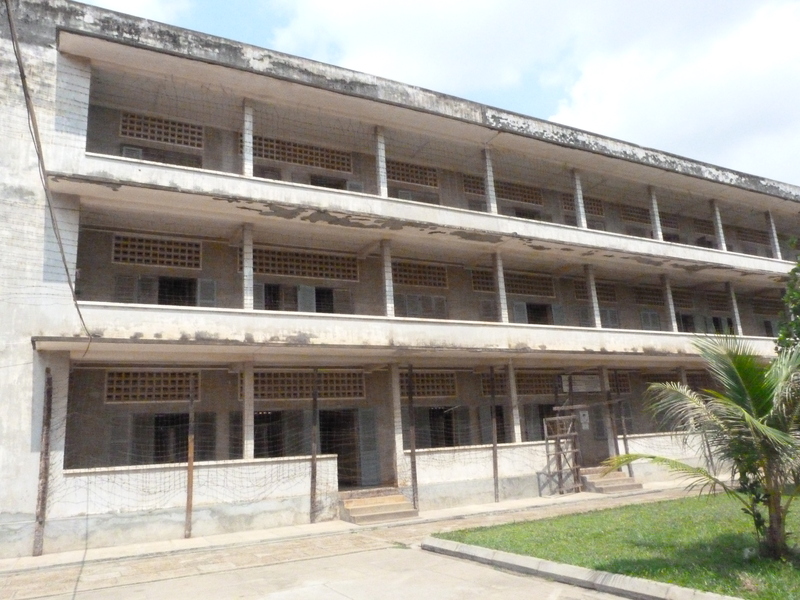 Before 1976 it was a used to be a High School but it was taken over by the Khmer Rouge and turned into a prison known as S21. 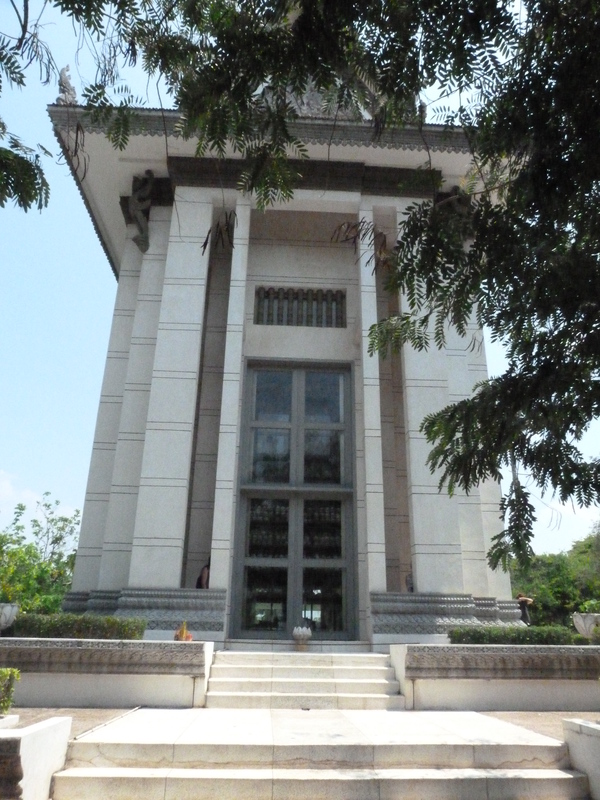 It is now a museum about the events of the Khmer Rouge regime from 1975-79. It is worth mentioning that this was not a prison for criminals but for anyone who was suspected of being against the regime. Everything has been left as it was found including beds, cells and even blood on the floor. We were going to go round without a guide but realised there wasn’t much information up and we wanted to find out more. Our guide only survived the Khmer Rouge regime because she fled to Vietnam with her mother when Phnom Penh was invaded but her brother, sister and father were killed.We learnt that Pol Pot, the leader of the Khmer Rouge wanted to create a new society and take Cambodia back to ‘Year Zero’. With ideologies based on communism he emptied cities, abolished money, private property and religion and sent everyone out to labour in the fields. Anyone who was seen to be intellectual was killed including teachers, doctors, artists, musicians, those who spoke a foreign language and even those who wore glasses. 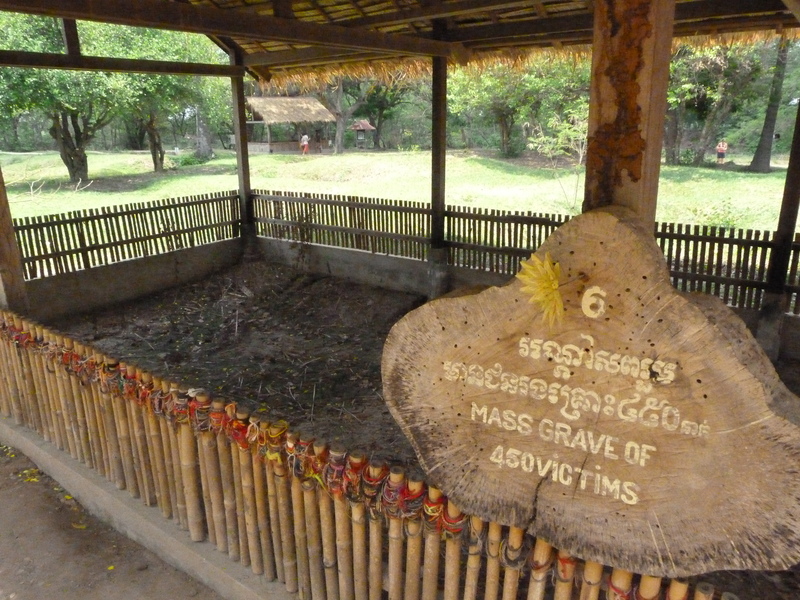 Many died through starvation but thousands of people were interrogated, tortured and killed at s21. Of the 14,000 people that were held there only 7 survived. 2 are still alive today! You can still see the cells that prisoners were kept in and some of the torture devices used. 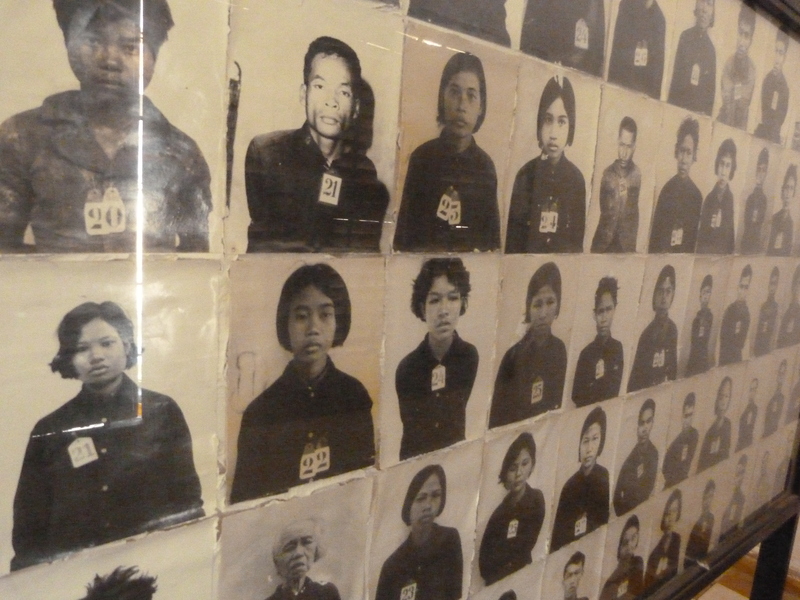 Perhaps the most haunting rooms are rooms where photos are displayed of all the victims but also the members of the Khmer Rouge some as young as 14. It was horrific to think anyone could carry out such horrific acts but testimonies explained that they joined up for fear of their own and their families lives. Some were brain washed and believed they would have a better life. “To keep you is no benefit, to destroy you is no loss”. 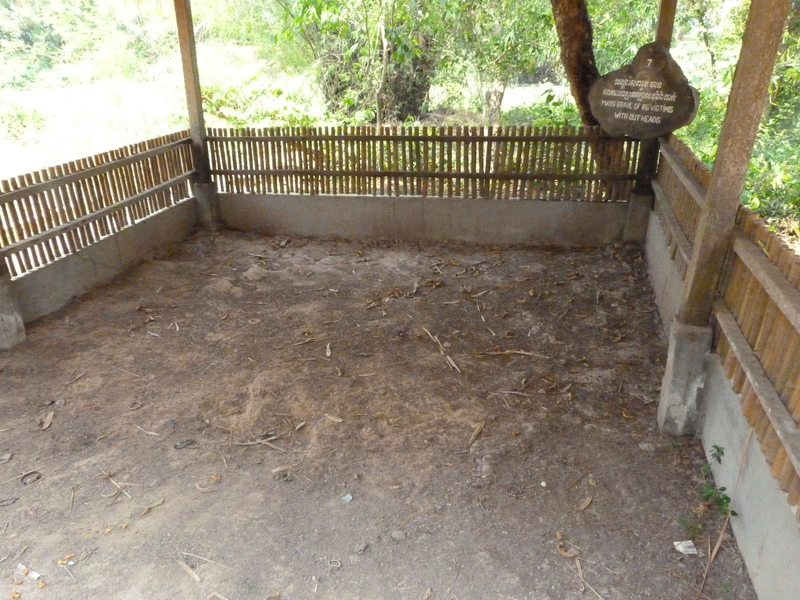 Now the site of the Killing Fields is a memorial centre and is a peaceful respectful place where you are encouraged to be quiet. You can see the massed graves and to this day bone fragments and bits of cloth come up to the surface when it rains. There are display cases of bones that have been found with extra piles that have been found more recently piled up on top of the cases. 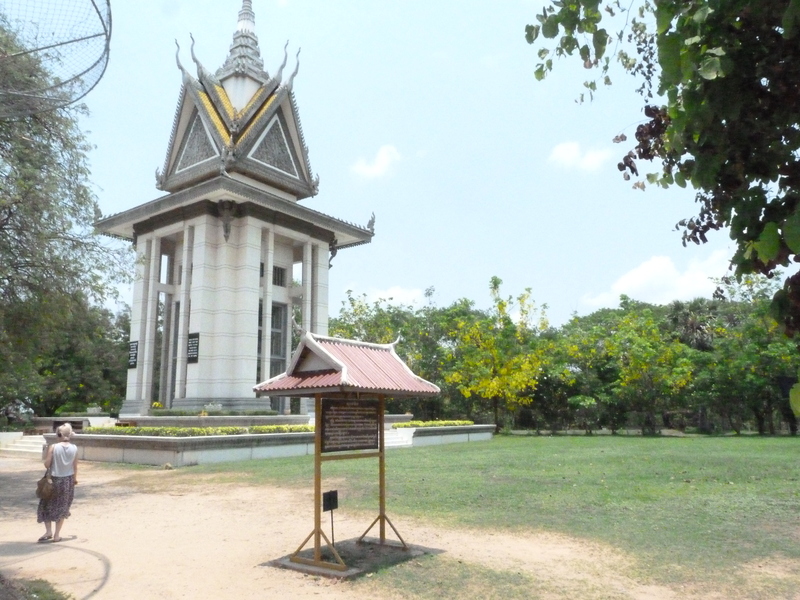 In the centre of the site there is a huge memorial for all those who lost their lives. It is filled with skulls caterogised by age, gender and how they were killed. I didn’t quite know how to feel as we drove away in our tuk tuk. It felt strange to change the subject and talk about or do anything else. It is quite scary how many people are completely unaware that this all happened. 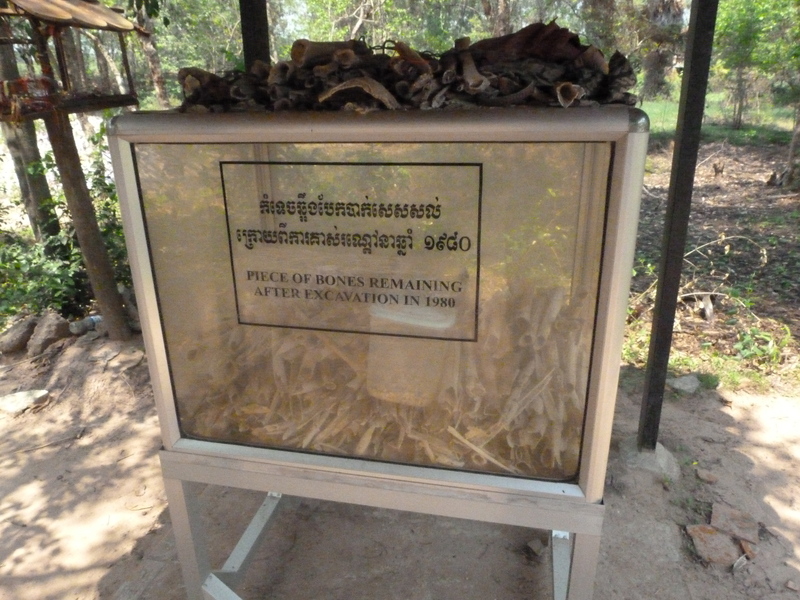 Pol Pot died naturally in 1998. Some of the other leaders were brought to trial in the last few years. From what I can find out it seems that only two are still alive and they are still waiting for a verdict in their trial!